first post. been lurking for quite a while. 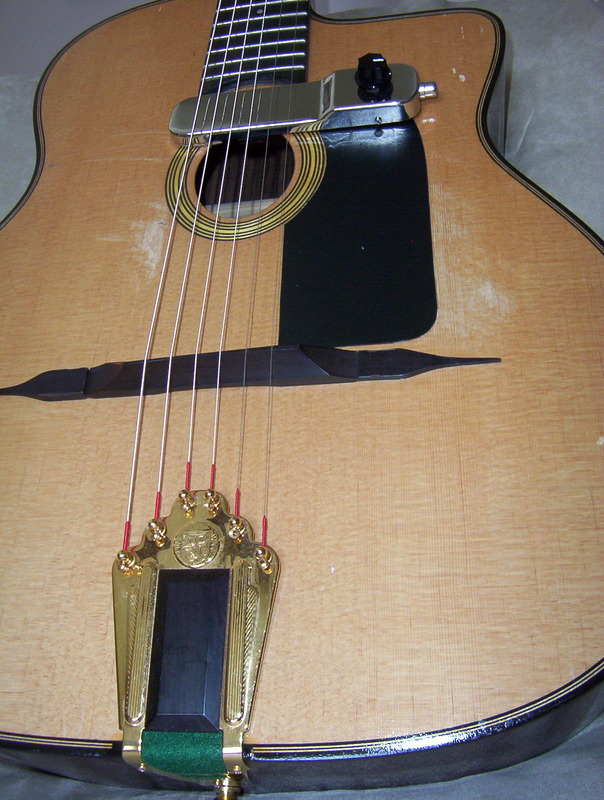 own 2 carved top & back luthier made archtops. 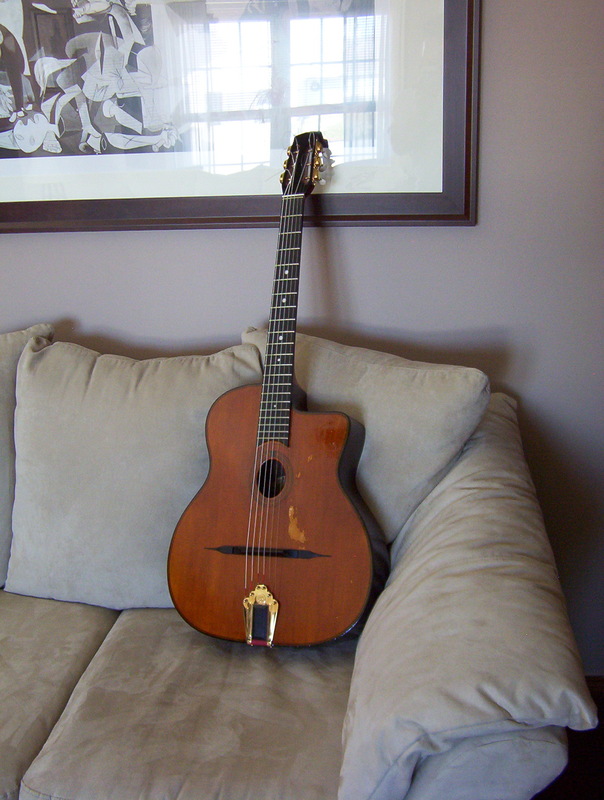 the gitane D-500 is my first and only GJ guitar at this point. i've not had a chance to sample other luthier made GJ guitars, but i do like this one a lot. So! 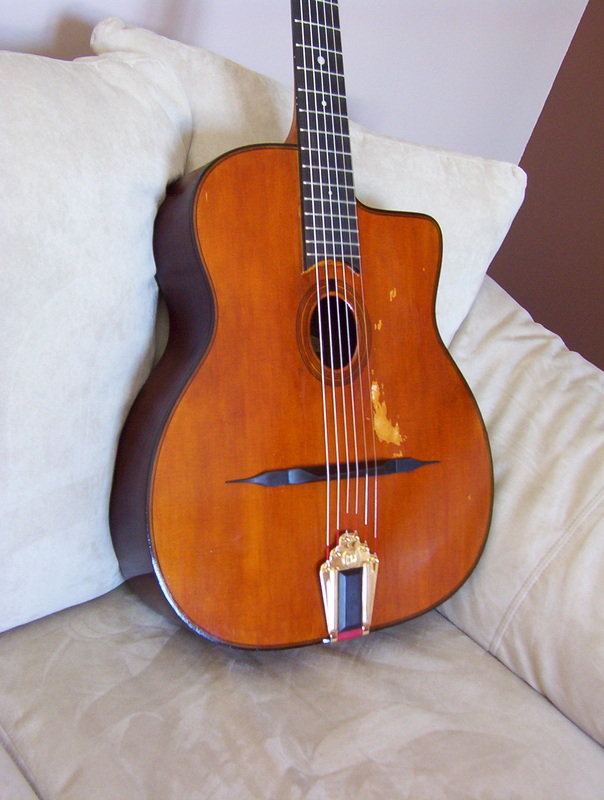 has anyone had success removing the finsh (what i'm projecting to be polyurethane-not lacquer) from a gitane d-500 (or other gitane model) and reapplying either a french polish or a thin coat of nitrocellulose lacquer? if so, were chemicals used to remove the finish, or sandpaper? reasons for doing this would be (1) improving the sound by freeing up the top & back to vibrate more freely & (2) changing the appearance of both the spruce top as well as the back & sides, possibly going with pretty much a clear coat (for that contemporary look), or the flip side would be something similar to the "cognac amber" finish of the Dupont MC-50 from "Sweet & Lowdown". if so, how well & easy did the original finish come off, and were the results what you were hoping to achieve? any advice, pros & cons, and recommendations are greatly appreciated. You might want to wait till summer to do that project so you can do it outdoor. Josh sanded down a D500 once... in his shop... in the winter... made him dizzy as he** ... he stoppped about midway and warned me about it. I'm not sure what they're using for finish but he said that it had a very pungent chemical smell and got him fairly tweaked. You'll find a lot of valuable info here. I refinished a DG255 with super results. I purchased a refinishing kit including a book from Stew Mac. Here is a link to the on line catalog, however I don't see the "kit". I bet it is in their hard catalog though. Email them for a catalog and inquire if the kit is still available. Here are some photo's of my "FrankenSelmer"
Good luck, and if you have any questions pm me. I refinished my 255 again recently with excellent results. I wanted to try my hand at French Polishing, and I was trying to get an antique look. Stripping the original finish off the guitar was a time consuming project because I hand sanded the entire thing. After stripping I originally applied a clear Shellac finish, but it just wasn't to my taste, so I decided to "antique" the guitar. I used a fresh can (1 month old) of Zinsser Amber Shellac, and Walnut colored Stain. I brushed on a few coats of the Shellac, sanding each coat, and then applied the stain pretty heavily. I then brushed on a few more coats of Shellac, and finished it out by French polishing to get a smoother finish. The whole project took 2 days (yeah, I know I rushed it), but it turned out quite nice. I also sanded smooth edges on the Moustache end pieces, the bridge, re-installed the DR tailpiece, and installed Ranier Miller tuners. Here are some before and after pictures. The finish is actually darker and browner than the camera was able to capture...it really did turn out quite beautifully. And the sound...the guitar was able to really open up. 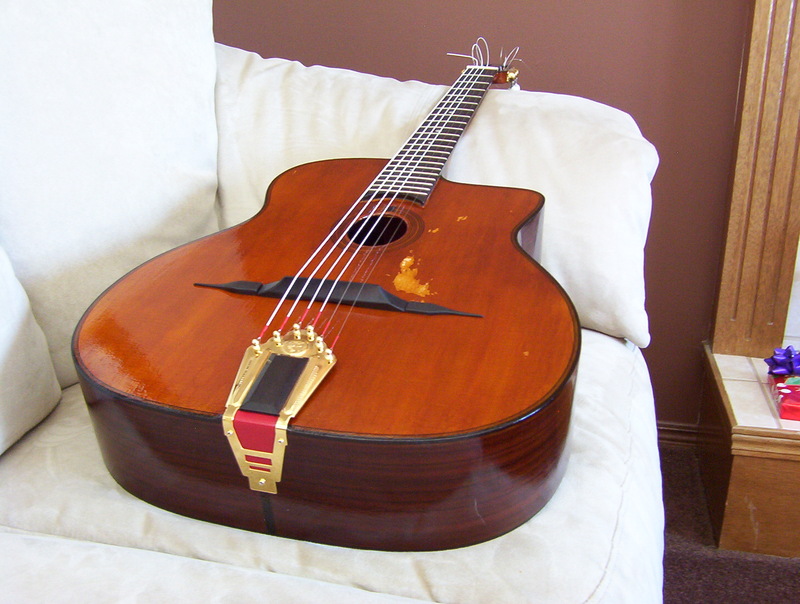 Really, a great looking guitar, nice job. How's the GJ scene in your area? Unfortunately, JazzDawg, it's nearly non-existant. I'm beginning to believe I'm the only person in Kansas that has even heard of Django, besides you of course . 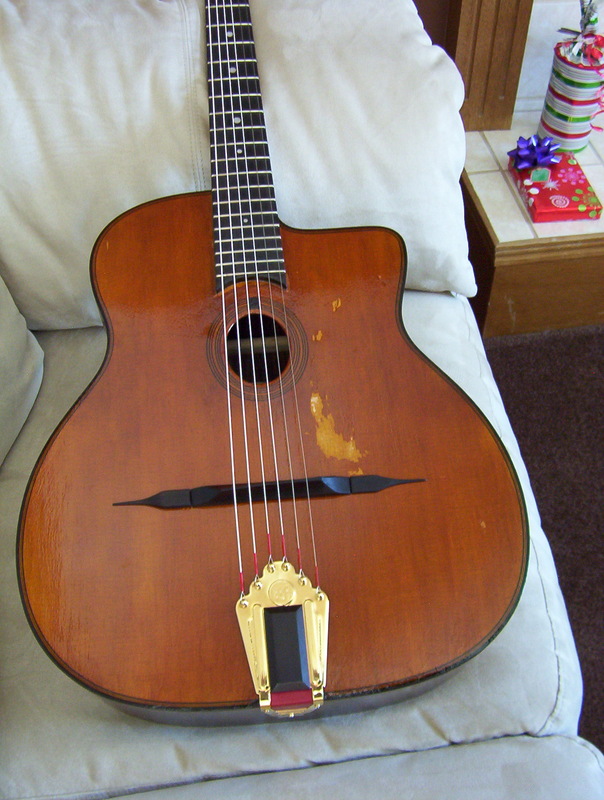 Regardless, I do play Selmer style instruments but I wouldn't consider myself a Gypsy Jazz guitarist. Whenever I get a chance to gig I play a variety of Peter Brotzmann, Django, Ornette Coleman, Roland Kirk, etc. I'm actually more into Free Jazz and the Avant Garde scene...and higly influenced more by Sax players than guitar players. However, I've been in love with Selmer guitars for years, and I find they actually work quite well with these styles. Free Jazz on selmers !!!!!! Man I love the sound of that! No one else might but I like it!